We are blessed to have many visitors, and we are truly glad to welcome everyone to our Church. 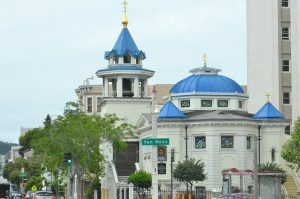 Because Orthodox Christianity is unfamiliar to many people the Bay Area — it was new to many of us as well — we have written this to help you know what to expect. Our Directions will help you find us. We are located in San Francisco, California at Van Ness and Green, just one block south of Union Street. See our Calendar for our schedule of service times and events. Our typical weekly schedule includes services on Wednesday and Saturdays evenings, as well as Sunday mornings. On Sunday morning we usually have 60-70 people in Church, about a fourth of them children. The beauty of Orthodox worship must be experienced to be understood. The Divine Liturgy expresses the entire Christian faith in a continuous song of praise and prayer addressed to God. It is focused on God, not on us. Since much of the service is the same every week, worshippers know it and can participate personally, either by singing along or just by prayerful attention. Worshippers are surrounded by icons (pictures of Christ and the saints), which remind us that we are participating while on earth in the worship of all the angels and saints in heaven. The entire service (except for the sermon) is sung, in English, to Russian melodies and chants. No organ or other instruments are used. The words are all from Scripture or ancient Christian texts — no rhyming metrical hymns are used. Our services are in the English language. 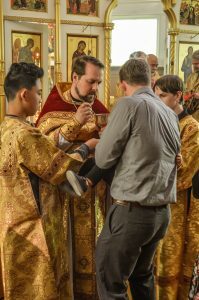 Communion is understood by Orthodox as a sign of membership in the Church and an act of commitment to the Church, so it is not given to non-Orthodox. In fact, Orthodox should not receive unless they have recently been to Confession and have eaten and drunk nothing since the night before. Orthodox who are not known to the priest should speak to him so he will know they are communicants; just ask a member to send word to him. The bread and wine at the side are not Communion, but are like a fellowship meal, called antidoron. This is frequently given to visitors as a gift out of love. The bread is blessed and set apart before communion and should be eaten reverently. Standing (and kneeling) are the Biblical postures for prayer and Orthodox traditionally stand at Sunday services. But for most people this takes some “getting in shape,” so feel free to sit as much as you wish. We have benches along the perimeter of the church for those who wish to sit. We don’t normally kneel on Sundays, as Sunday is the Day of Resurrection and kneeling is considered penitential; we kneel a good bit at weekday services during Great Lent. Visitors Welcome — Orthodox try not to talk during the services, so it may be that no one will greet you until the service is over. Be sure to check in with our Church Greeter, Frank, at the candle stand, and he can get you a weekly bulletin and answer any immediate questions you may have, After Sunday services we have a fellowship meal, a time of food and drink together downstairs in the fellowship hall; you’re invited to join us there so we can get to know each other. No one will put any pressure on you to join the Church; many people “visit” our Church for years. The normal Saturday Evening Service is called Vigil. It lasts about an hour and a half. Orthodox Christians, like the Jews before them, believe the new day starts on the evening before. Vigil is a preparation, not a substitute, for worship at the Sunday Liturgy. It consists mainly of singing of Psalms, especially Psalms 104 and 141, the “evening offering of incense,” and the hymns “O Gladsome Light” and “Lord, Now Lettest (Luke 2:29).” It has themes of Creation and Resurrection as the “eve” of the Day of Resurrection, the first day of the week. 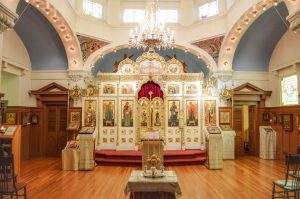 What does Theotokos mean? Theotokos (Greek for Mother of God) is a title for the Virgin Mary. Orthodox love and honor (but do not worship) her because of our union with her Son. The attention given her in the Church also expresses our faith that Jesus Christ is truly human, born of a woman as we are, yet mysteriously has always been God, so His human mother can be called the Mother of God. In many hymns she is a sign of the Church as the beloved bride of God; her exaltation as “more glorious than the Seraphim” is a sign of the exaltation awaiting all who “hear the Word of God and keep it” as she did. What are Icons? An icon is a painting of Christ, His Mother, a Saint, or an event in the life of the Church in the history of salvation. Icons may be executed in mosaic, on wood panel, or in large flat scenes called fresco. Holy Trinity Cathedral also possesses beautiful images wrought in stained glass. They must be painted according to a strict tradition because they are an important way the Faith is handed down and taught. An icon is not merely decoration or a religious painting, but a holy presence, teaching the truths of the Orthodox faith, helping guide and focus the attention of the faithful. Icons and crosses are kissed (“venerated”), but not worshipped, as a sign of our belief that in Christ God took a physical body, and became part of our physical world so we could know Him. How can I join this church? We don’t hurry anyone to join; many people “visit” for years. But after visiting, if you wish to become a member, speak to the priest. 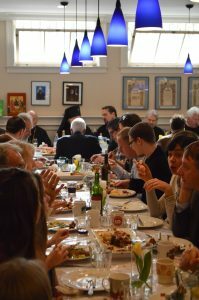 Those wishing to be members are received as catechumens (learners), and usually spend at least a period of time attending the services and learning the Faith. Then, if they have not already received Christian Baptism they are Baptized, and in any case are Chrismated (anointed with oil as the “Seal of the Gift of the Holy Spirit”) and given Holy Communion, which makes them full members.